In a bit of a departure from our usual content I’m going to contrast a continental scale feature from Asia with some SUDS (Sustainable Urban Drainage) applications nearer to home. 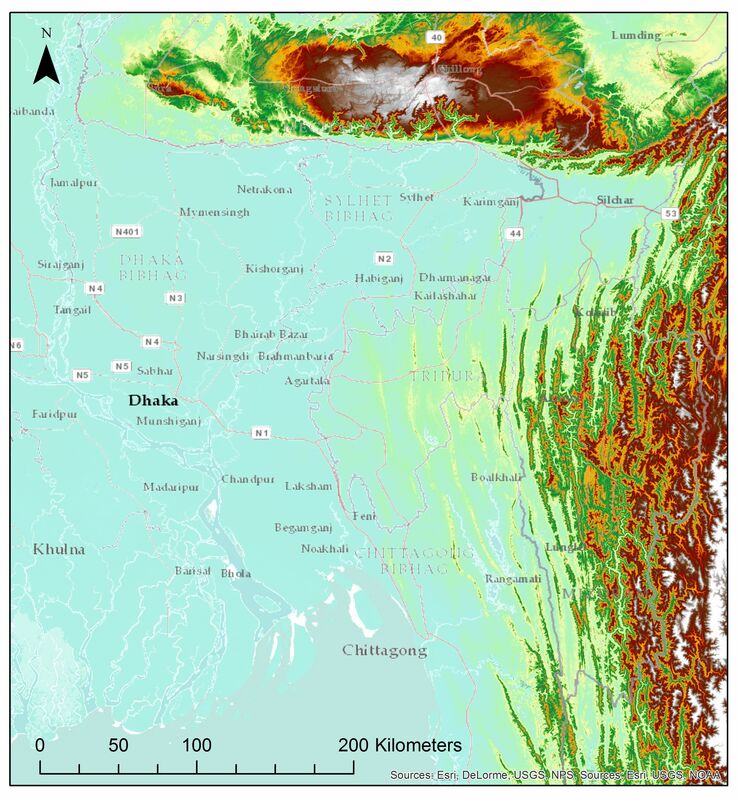 At the moment I’m doing some work on bank erosion and river morphology in Bangladesh (which you can read about here), and I was struck by the similarity in processes between an area of Bangladesh called the “Sylhet Trough” and the sort of balancing/settling ponds that are often incorporated into managed water systems. The principle of these water management ponds is that the velocity of water through them is very slow. 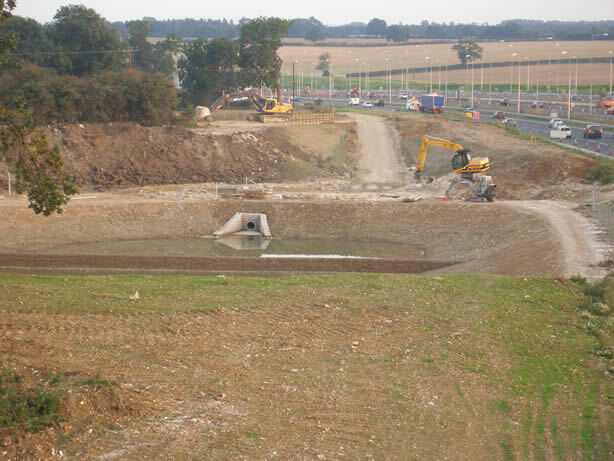 This effect is used both for flood risk management in which high runoff is retained in the basin and released slowly, reducing downstream flood risk. Also the low velocity means that the flow has less energy to transport sediment and so it settles out, this is particularly effective where the water entering the pond/basin has a higher velocity. The sediment laden water flows into the basin, slows dramatically and thus particulates drop out of the water and are retained in/as sediment on the bed. This is harnessed in a variety of places/applications. New roads often have balancing ponds to received storm runoff to reduce the amount of heavy metal particulates reaching water courses. 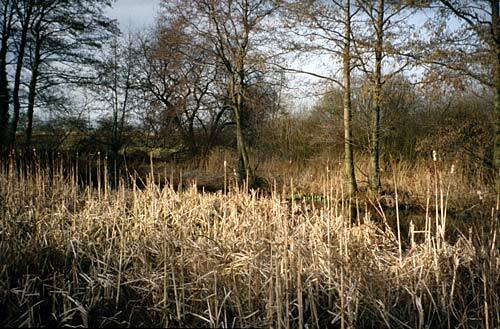 Often industrial processes which require a lot of water, and thus produce a lot of waste water will discharge this into ponds to remove sediment, in some cases these features can eventually become important habitats and even SSSIs (Sites of Special Scientific Interest) for the wildlife they support. The same principle of fast to slow flow is also used in water treatment works to remove sediment from water, often as an initial stage in drinking water or waste water treatment. It’s somewhat humbling to think that processes and structures which we have designed to help manage our own urban drainage can be observed operating in nature at 3 orders of magnitude greater than our own settling and balancing ponds. Goodbred, S. L. and S. A. Kuehl (1999). “Holocene and modern sediment budgets for the Ganges-Brahmaputra river system: Evidence for highstand dispersal to flood-plain, shelf, and deep-sea depocenters.” Geology 27(6): 559-562. Mukherjee, A., et al. (2009). “Geologic, geomorphic and hydrologic framework and evolution of the Bengal basin, India and Bangladesh.” Journal of Asian Earth Sciences 34(3): 227-244. Datta, D. K. and V. Subramanian (1997). “Texture and mineralogy of sediments from the Ganges-Brahmaputra-Meghna river system in the Bengal Basin, Bangladesh and their environmental implications.” Environmental Geology 30(3-4): 181-188. This entry was posted in Geomorphology and tagged fluvial geomorphology, geomorphology, sediment, sediment transport, SuDS. Bookmark the permalink.